NEW, ORIGINAL DESIGN... is Julie's Signature Necklace is a best seller. 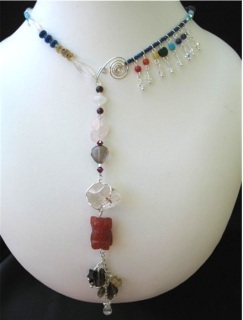 This ADJUSTABLE NECKLACE attaches in the front, and can be worn at any length. Each Necklace is Unique. It is versatile and can be adjusted to different lengths. Unlike conventional necklaces which attach in the back, my new design attaches easily in the front. The Signature necklace can be worn in various styles such as a choker, which gives a new look by off centering the front of the necklace to the side, lending the design to A-Symmetrical. Or, for evening wear, a gown with a low cut in the back, the necklace can be worn with the pendant flowing down your back. Adjust Julie's signature necklace to wear with any neckline and any occasion, complimenting both casual and formal wear. Also, I have added a spiral clasp made of sterling silver or 14K Gold, which has an easy- to- see- front closure. When designing my creations, I strive for exacting standards, using quality natural gemstones, and crystals, with sterling silver clasps, fittings, and wire wrap. (14K Gold upon request). All work is hand crafted by Julie. Rose Quartz "Circle of Love" is the focal point of this Healing necklace, with hand crafted spirals dangling from each chakra gemstone. Julie's signature spiral closure can be attached at different areas to wear at any length. The 7 Chakra gemstones, Amethyst, Lapis, Sleeping Beauty Turquoise, Hand carved Malachite heart, Citrine, Carnelian and Red Jade. Faceted Amethyst, fluorite, lapis, and tourmaline are some of the gemstones that weave this beauty together. Swarovski Crystals throughout adds sparkle. The Rose Quartz Pendulum is a great healing tool in energy work, with the intentional position of the Rose Quartz donut can be securely held for dowsing. 26" adjustable necklace with sterling silver closure. Let the Owl be your guide while sitting below a beautiful healing Double Terminated Quartz Crystal. This Beautiful One of a Kind, Chakra Necklace, has a Hand Carved Owl sitting just below a Double Terminated Quartz Crystal. Below the owl are two sets of three Faceted Smokey Quartz crystals, two Citrine and one obsidian star and finally a Swarovski crystal tear drop for added stardust. 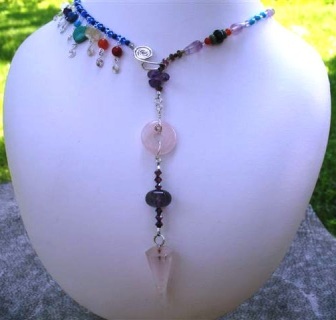 A combination of Garnet, Rose Quartz, Lapis Faceted Clear Quartz, Amethyst, and moonstone make up the necklace. The seven chakra gemstones are Quartz, Amethyst, Lapis, Sleeping Beauty Turquoise, Malachite, Yellow Jade, Carnelian and Red jade. 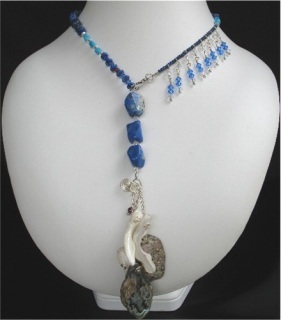 This combination of natural Abalone shell, Mother of Pearl , Blue Lapis Lazuli, Sleeping Beauty Turquoise and Garnet is a lovely combination of colors. Accented with Swarovski Crystal, it sparkles like the sun dancing off the ocean waves in the mid-day sun. Wrap your being in peace and tranquility. This 23 inch long necklace is adjustable and finished with sterling silver. This elegant chakra wrap-a-round necklace is a one-of-a-kind creation. 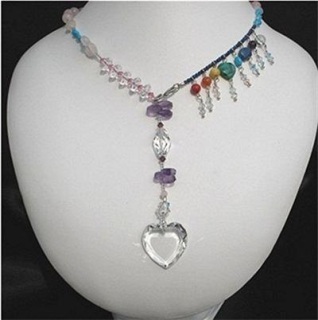 The chakra gemstones are as follows, 6mm faceted grade A Quartz, 6mm Amethyst , hand carved Lapis Zuni Bear, Sleeping Beauty Turquoise,- 10mm hand carved Malachite puffy heart, African opal, & Red Jade. Faceted Rose Quartz and Amethyst make up the pendant along with a gorgeous 20mm Grade A Faceted Clear Quartz crystal and a 30mm Swarovski faceted crystal Heart finishes this beautiful 22 ½” ADJUSTABLE necklace which attaches in the front for ease, a wearable work of art. .
#691-26 This beautiful ONE OF A KIND combination of Peridot and Amethyst will soothe your soul. Inspired by the deep purple moon and the green hills of a field, which are gently reflected in iridescent waves of color, represented in the focal point pendant made of pure abalone shell. 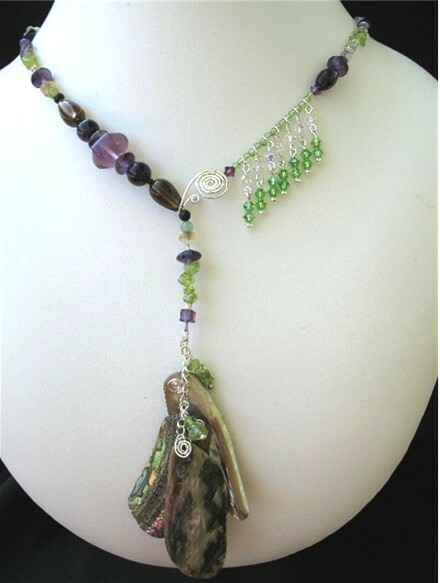 This elegant Abalone Shell and Peridot Adjustable necklace has a combination of Amethyst, Fluorite, Peridot, and Citrine. For a touch of Grounding I added some Smokey Quartz and Rainbow Obsidian. This Beautiful Necklace is 25” long. This necklace features Julie's signature spiral sterling silver Clasp. Enjoy and wear in good Health.